Left Dalhart, TX and played an outflow boundary near Hereford, TX. 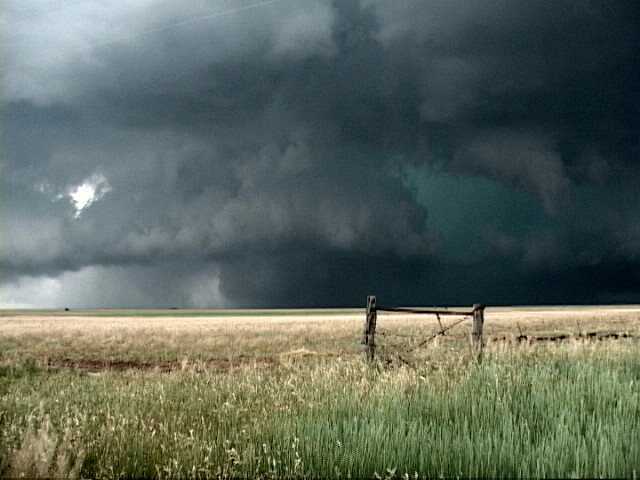 We chased two big supercells that started as classics and later were MONSTER HP storms. 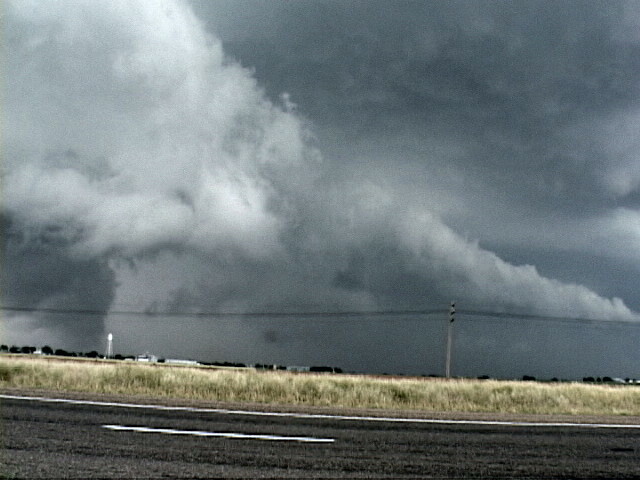 The first one started northeast of Hereford and tried very hard to tornado before becoming outflow dominant. We were on the scene from initiation, but as time went on more and more chasers arrived and it was the worst case of chaser convergence I've ever had the "pleasure" of driving in. As we stair stepped east and south we also had a harrowing mud road experience, but came out unscathed. 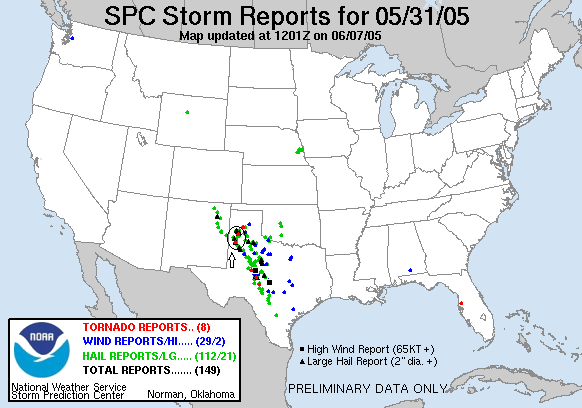 This was a frustrating storm that surely tornadoed, but by the time it did it was hopelessly outflow dominant and there was no way to see any tornadoes that might have been occurring in the rain. Once that storm had become hopelessly outflow dominant we headed off to the southwest to play the tail end storm near Earth, TX. This storm started as an LP and we initially played with the hail until it developed a large wall cloud and moved into classic supercell structure. Once again the storm tried extremely hard to tornado and we may have seen it develop a weak multi-vortex tornado briefly but we can't confirm, though other chasers did see it. Again the storm shifted into an outflow dominated "ice machine" and we spent as much time running from hail and flying dirt as we did trying to see tornadic development. Eventually as we fled towards Lubbock the storm was now an even bigger HP tank than the first storm, and due to construction we realized that we were hopelessly trapped with the hail core filled with baseball sized hail coming up on us fast. At this point we called off the chase and ran for our lives. To make matters even more interesting, while I was driving, I watched my fuel gauge suddenly go from 3/4 of the tank full to empty! It turned out to just be a broken sensor but we didn't know that at the time. Anyway, we ended up finding a recently built but not yet opened hotel and parked the vans under the awning to protect ourselves, but actually only got a glancing blow from the core with golfball-sized hail and strong winds. We spent the night in Lubbock, TX. Initial towers start to go up near Black, TX Waiting for the Hereford storm to get going, another storm to the northwest has a well developed lowering that we have to keep an eye on. The tour group looks on as the storm takes off and looks like it's about to tornado. Check out the huge beaver tail on the storm! Violent rotation right near us! I though the storm was going to drop a cone right there. The storm starts to get outflow dominant. Check out the enormous block wall cloud shrouded in rain. The storm probably produced a tornado, but it would have been impossible to see. Enhanced to get a closer look. Hard to believe something didn't touch down in there at some point! The storm cycles up another thick wall cloud and beaver tail. The storm produces a stout mid-level funnel but it doesn't make it to the ground. The storm goes HP as the wall cloud crosses the road to our north. Monster shelf cloud surges towards us. A larger scale look at this now HP monster. Second storm gets organized near Earth, TX. Well defined wall cloud being pushed forward by outflow. While the storm cycles, we stop to sample the hail core. Now Now a classic supercell, the storm develops another wall and tail cloud. The storm produces a large wall cloud almost to the ground. Was this a cone tornado? Enhanced to get a closer look. The lowering is very close to the ground, but I don't think there is a tornado there. Hmm, can't quite confirm contact with the ground, so it doesn't count. Earth storm becomes outflow dominant as we near Lubbock, TX. Dirt propelled by outflow crosses the road as the chaser gaggle flees. Forced to run from the hail core, we hide under the awning of an incomplete hotel. After the core passes, corkscrew updraft on the rear flank. More rear flank convection.